Revelation comes in the strangest places. Like, for example, I had this eventual moment of clarity about what it was that went wrong in the Lepage Ring, and what do you think sparked it? Of all things, last night’s performance of Ernani at the Met. Now, this is not to say that Ernani is a success on the dramatic level (it most definitely is not) but there is one scene—well, let’s say one set—in this 1983 Pier Luigi Samaritani staging that points toward what Lepage might have done differently. It’s the act 3 “Tomb of Charlemagne” setting, and it’s a marvel of elegant efficiency. There is no attempt to particularize the space beyond a giant equestrian statue set on a massive pedestal. The rest of the stage picture is all an enormous swirl of a staircase, swooping a giant curve through four stories of void. This set makes only the most token gesture toward mimesis (the “bronze door” Carlo V strikes to summon his followers) but otherwise is almost completely non-specific. There is no attempt at indicating a particular location, only a general sense of an impressive and awesome space, a place where important things happen. 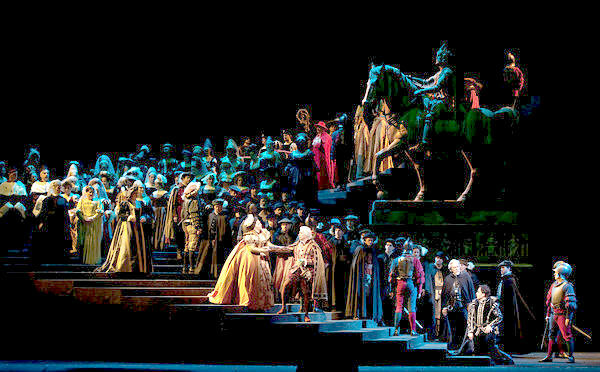 Moreover, it’s a practical space, flexibly suitable to the intimacy of Carlo’s aria, the martial clatter of “Si ridesti il Leon di Castiglia” and the grandeur of “O sommo Carlo.” A single soloist on the stairs looks majestic; the massed chorus and ensemble look gracefully distributed. For the purposes of this argument, I’m going to call this kind of set a “rhetorical theatrical space,” in part because this sort of performance place is an example of what is more broadly called a rhetorical space, i.e., a physical location devised to facilitate communication. Or, to put it in simpler and more specific terms, a “rhetorical theatrical space” is a set designed with the primary goal of communication of text and music, with the traditional functions of stage settings to indicate physical location either ignored or relegated to secondary importance. Some excellent examples of pure rhetorical theatrical space can be found in the designs of Wieland Wagner for Bayreuth in the 1950s: a raked disc center stage to isolate the principals from the outside world, the circular shape facilitating elegant sweeping movement by the timeless immortals. For Die Meistersinger, he even imagined the “festival meadow” as an abstraction of a modern concert hall, with the chorus ranged in semicircles as if for a performance of Beethoven’s Symphony No. 9. The “Machine” upon (or mostly around) which Lepage placed his Ring I think has a splendid potential as a rhetorical theatrical space, but it falls short. One very basic failing is that the planks of the Machine itself are not particularly suitable for use as acting areas. Turned to certain angles, the device can create a “cliff” suitable for perching, a couple of different types of ramps for entrances and exits, and some low rock benches for seating. Lepage also does a witty staging of the “Ride of the Valkyries” with the heaving planks suggesting gargantuan merry-go-round horse. 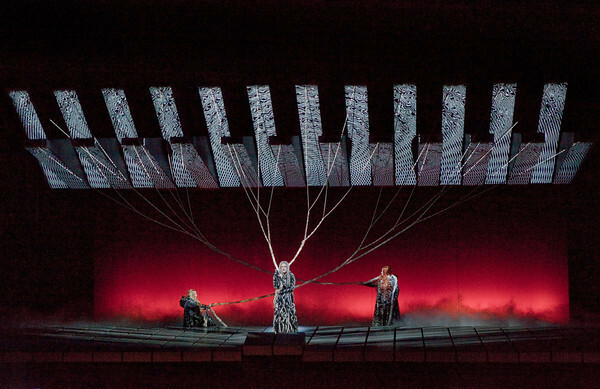 But in general, the singers don’t spend much time on the Machine; almost all the action of the Ring (and certainly all but a few minor moments of Götterdämmerung play out on the narrow boardwalk on the apron of the stage as the Machine forms a three-dimensional backdrop. The problem here is that this downstage area is not an effective rhetorical theatrical space. It’s cramped and flat, so the performers look cramped and unmotivated whether they are moving or at rest. This was particularly a problem with Deborah Voigt in the final drama. She has a nervous habit of wandering a step or two for no dramatic reason when she’s nervous or distracted on stage, and with only the apron area to wander across, she ended up pacing on and off for six hours. 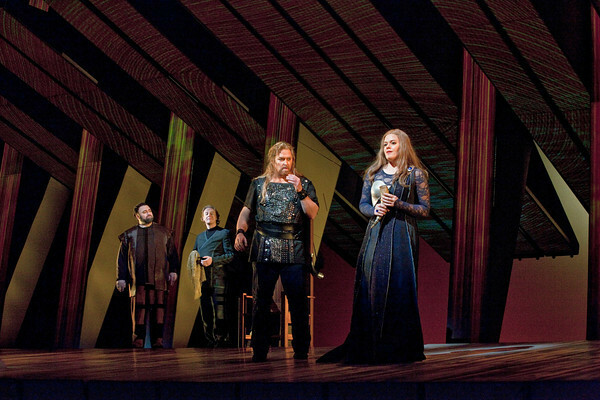 The message that very quickly was communicated to the audience was: pay no attention when Brünnhilde moves because it’s not going to mean anything anyway. Another issue is that a rhetorical theatrical space is by its nature abstract and general, and by extension, the effect of the space is weakened when it is used “literally” or mimetically, i.e., in an attempt to reproduce some specific location. Most times, though, Lepage settled for using the machine as a mere backdrop: in the second act of Siegfried, for example, where the rear wall broke open only long enough for the inflatable Fafner to bob out. Worse, in that opera, the video imagery, now handed off to Pedro Pires, turned disappointingly literal: an animated cross-section of forest floor for the first act, a conventional movie of fluttering trees and babbling brook for the second. It’s not that these animation effects were crude or badly executed; on the contrary, their very polish tended by contrast to make everything happening in front of them look phony and static, uninteresting. Because the film in the background so literally indicated “fairy tale forest,” we were forcibly reminded that the estimable actor Jay Hunter Morris wasn’t Siegfried, but rather a stocky middle-aged man in a blond wig, sitting on what looked like the deck of a cargo ship. And so the Machine, potentially a powerful and effective rhetorical theatrical space, morphed into an inefficient mimetic space: knowingly or not, Lepage was competing with Otto Schenk’s consciously mimetic Ring, and losing. Worst was Götterdämmerung. 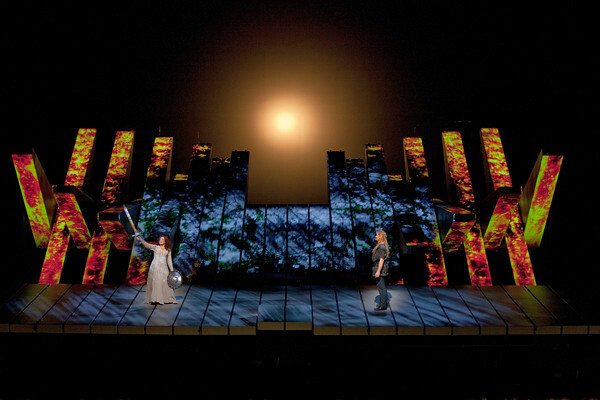 While I understand the point of view of Anthony Tommasini in the New York Times—that, essentially, the Machine called less attention to itself and therefore distracted less from the opera—in another sense, here is where the functionality of the set as a rhetorical theatrical space completely broke down. Now, it did start well, with the planks of the Machine pistoning up and down like a gigantic mechanical loom. The Norns were trapped in a cramped overhanging space, but I was willing to forgive that for the powerful and unexpected image the scene provided. But then, the Machine did its “reset” routine, all the tumblers spinning like a 2-D Rubik’s Cube, and we returned, sort of, to the Valkyrie Rock, seen here in about its fourth different configuration. 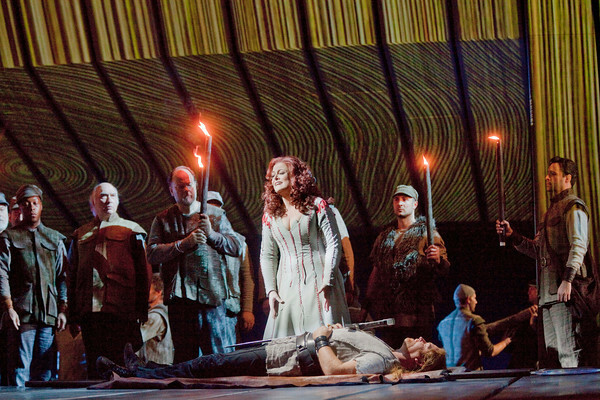 Entering from opposite sides of the stage (does Siegfried snore? ), the young lovers then proceeded to sing their duet essentially “in one” while the machine just sat there and looked handsome in the background. Eventually Siegfried bounded in gingerly fashion up the mountaintop and Brünnhilde fled back into the wings as the metal monster swung into action. So now the Machine turned movie screen/theme ride for a while: water projections for the Rhine, then a stylized flatboat where Siegfried and Grane (styled as “War Horse”) bobbed pointlessly for a while, then backdrop again as the rear wall of the Gibichung Hall, here imagined as a sort of timeless great hall paneled with slats carved from the same giant redwood. The effect was handsome, but the performing space remained essentially the same: the bare apron, with the Machine looming behind. Stage crosses were mostly limited to lateral left-right, flat and uninteresting, and because there was so little depth the performers mostly stood in a line singing out to the audience, concert style. Yes, this was “rhetorical” in the purely musical sense, but it failed utterly in the theatrical. The Machine was actually used as a significant acting area only once during the evening, when the Rhinemaidens skittered up and down the heavily raked wall/platform decorated with a film of a mountain stream. This wasn’t bad, but the literalness of the projections and the obvious flatness of the machine clashed distractingly: it wasn’t real, and it wasn’t stylized; it just looked sort of naïve. But the focus of that scene is not, of course, the frolic of the Rhinemaidens; rather, it is (or should be) the funeral march for the slain Siegfried. But what kind of cortege can be choreographed on a narrow strip of stage, with everyone exiting through a single portal? 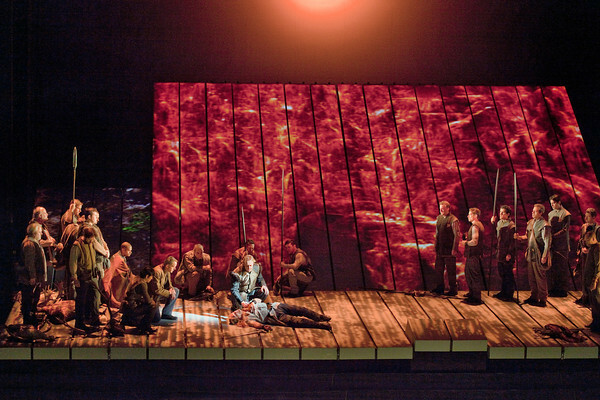 Lepage’s staging was cramped, clumsy-looking, with Siegfried’s body lost in scrum of shambling vassals carrying offstage dozens of superfluous props. It didn’t look majestic, and it didn’t look deliberately or ironically small-scale; rather, it just looked like a mistake. The issue, of course, is that Lepage set himself up for failure here in accepting a Machine that couldn’t be trusted for use as an acting area, at least not with a couple of dozen AGMA choristers having to tread its treacherous planks. I can imagine a very striking image of the march going up the hill of the Machine and then down the other side, or even the men bearing the corpse remaining immobile as the Machine slowly bore them away. But so obvious a use of the mechanism was either technically unfeasible or else beyond Lepage’s imagination: either way, it’s a failure to create a rhetorical theatrical space. Again to facilitate the movements of the Machine, the pyre had to be set far back under an overhang, and on a lowered stage level so that even from Orchestra it was only partially visible, as if glimpsed through a mail slot. (From upstairs, I am sure it was totally undetectable.) But this visual compromise was necessary in order to allow the puppet of Grane to roll unimpeded into the cleansing flames—never mind that Grane looked like nothing so much as a mechanical bull in a country-western bar. The final cataclysm was quite horribly tame, and again, it seemed that whatever effects were offered (the slanted wall to reflect the projections the burning building and the Rhine, for example) were chosen only because these were the most optimal solutions that could be wrung out of the Machine. So even as a visual/decorative element, it turned out, the Machine was something of a failure. The Machine, in fact, turns out to be a high-tech version of the Nibelung’s Ring: blindingly attractive when first imagined, then utterly destructive when it’s actually put into action. If Robert Lepage suddenly developed a sense of irony (and a feeling of responsibility to put right his shortcomings) what a production could be built around The Failure of the Machine! This entry was posted on Friday, February 3rd, 2012 at 5:48 pm	and is filed under Rough and Regie. You can follow any responses to this entry through the RSS 2.0 feed. Both comments and pings are currently closed.